Your new bindings work best on a dialed-in board setup. 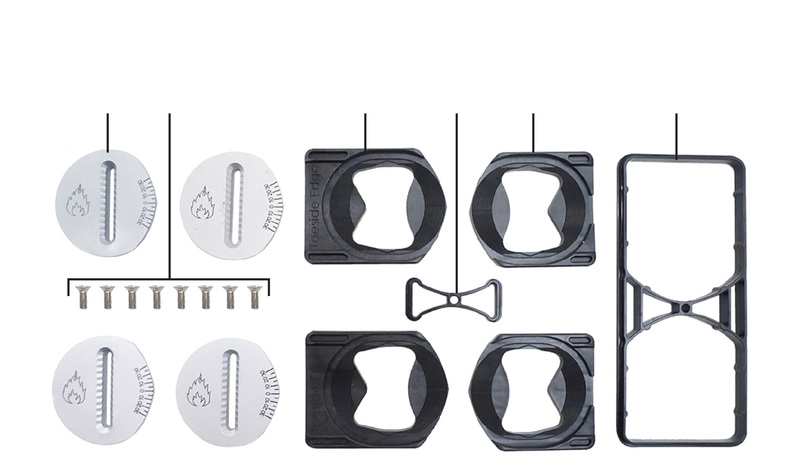 For puck compatible factory splitboards. For other puck brands please refer to the manufacturer’s website for setup instructions. • The outside length from puck to puck should be 7 ⅝” (19.35cm). • The bindings should slide on easily. If it feels like they are jamming, check your puck alignment and make adjustments as necessary. • If your pucks are brand new, the fit might feel tight but will break in after just a couple of times changing over. • If still too tight sand lightly on the top and sides of the pucks with the included sandpaper. Check fit while pucks are wet. • With the bindings on the pucks in ride mode, you should be able to easily snap down the toe ramp. If you can’t, loosen the screws and nudge the toeside puck in slightly. • Attach the touring brackets with the yellow patched screws. • Orient the heel rests so that the arrow points toward the nose of the board. Attach heel rests with the blue patched screws. • If you have a DIY Splitboard using ski screws: you will need to use 5.5 x 11.5 mm ski screws for the heel rests. Ski screws used with Voilé climbing heels are too long and will bubble your base. If you need these shorter screws and cannot find them locally, please contact us. OUR BINDINGS ARE FULLY ADJUSTABLE! pack so it’s always with you when you’re out in the backcountry. Check to see that your screws are tight from time to time for uninterrupted shredding. Features a one piece crossbar that extends from one set of bolts to the other for the stiffest possible connection between board halves. The cam lever clamps the board together, taking gaps out of the board seam, and rotates out of the way for touring. 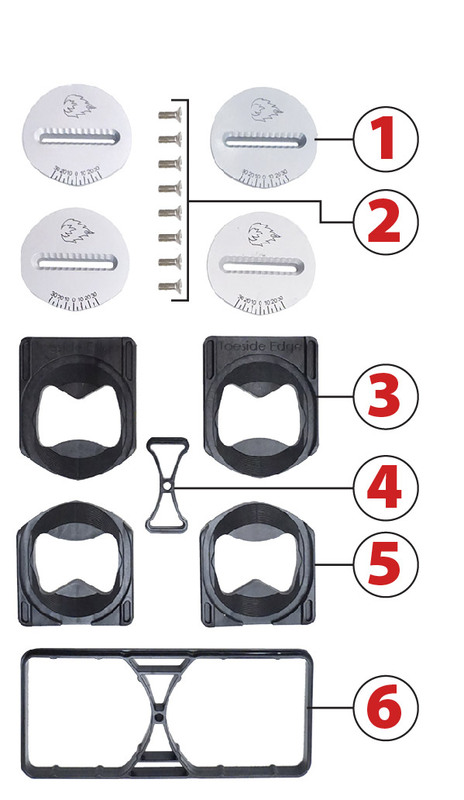 Our tip and tail clips oﬀer a custom ﬁt to match the variability in any board. With ﬁve progressively tighter notches you can get your board as tight as you want. Allows splitboarders to lock down their heel in tour mode to better adapt to diverse split-skiing terrain. Lockers attach to the heel rest. Rotate the lever and step in to lock. Rotate lever back to release. Getting to know your pucks. Oversize aluminum center disk overlaps binding channels for maximum strength and rigidity. 8 x M6 x 16mm Flathead Screws. +1 extra for your hardware stash. For placement on the toeside edge of your board. For use with Arc, Magneto, and Burton Hitchhiker bindings. For placement on the heelside edge of your board. For use with all Spark R&D & Burton Hitchhiker bindings.